Omar Khadr’s first appearance before the Canadian public last week sparked considerable interest. In the Edmonton courtroom his lawyer, Dennis Edney, presented legal arguments why Omar should be released from the maximum-security institution where he is currently detained. Over one hundred supporters were present and at least a dozen reporters witnessed the day’s events. In the resulting press coverage several images were repeated and the reporting largely consistent. What most reporters didn’t mention is the real story of Omar Khadr. They didn’t mention that Omar is blind in one eye due to shrapnel from the Delta Force bombing of the compound where 2,500 pound bombs were dropped on the compound where Omar was staying. And they didn’t mention that during a decade in Guantanamo, he did not receive any medical care to prevent total loss of vision, and they didn’t mention that most of those years Omar was in solitary confinement and exposed to 24 hours of fluorescent lighting, or that for years he was denied sunglasses for “state security” reasons. They didn’t mention that Bagram guards referred to Omar as “Buckshot Bob.” Under that shirt are wounds where two chunks of his chest and shoulder were blown out when he was shot in the back at point blank by a Delta Force soldier. Didn’t mention that while those wounds were still raw, he was hooded, wrists shackled to the ceiling and made to stand for hours. They didn’t mention that Omar has spent most of the past 11 years in solitary confinement, deprived of all human contact in a window-less cell, food thrust through a slot in the door. They didn’t mention how overwhelming it must have been for him to sit in a room filled with people who were scrutinizing every move. They didn’t mention his incredible composure and ability to sit still for hours intensely-focused on dry legal arguments and the seemingly endless paper shuffling of the judge and five lawyers. They didn’t mention that for most of a decade he was shackled to the floor of his cell and five times a week led in handcuffs and leg irons to a small chain-link cage for 20 minutes of solitary exercise. They didn’t mention that Dennis Edney has represented Omar on a pro bono basis for the past decade. From their first meeting in Guantanamo, Mr. Edney, at great personal and financial sacrifice for himself and his family, has waged a legal battle as intense as if Omar were his own son. “I never thought I would go to such an evil place and see such evil being done. Guantanamo changed me. I went in a lawyer and came out a broken father”. They didn’t mention that Omar finally free, will be welcome to join the Edney family in their Edmonton home. They didn’t mention that there is a finally a fundraising campaign where people can donate to help Dennis Edney with ongoing legal expenses in his battle to free Omar. They didn’t mention that, Omar despite his initial confidence and hope, was the only Guantanamo inmate to be totally abandoned by his own country. In 2003, after a year without any contact from his government, Omar was thrilled to finally have a visit from Canadian government officials. During an ongoing interrogation, Omar painfully realized that they were not there to help. “You don’t care about me. Nobody cares about me.” They didn’t mention that last spring, Vic Toews (at the time Minister of Public Safety) denied access to a Canadian press prison interview with Omar as a “public safety threat.” They didn’t mention that since his long awaited repatriation, Omar has had an outpouring of letters and support from across Canada and in Monday’s courtroom, he finally had an opportunity to see the faces of Canadians who do indeed care for him and in return they finally had a long-awaited-for opportunity to see the young Canadian whose mistreatment has been on their conscience for over 11 years. They didn’t mention Omar was never tried in a regularly-constituted court. In 2006, the U.S. Supreme Court ruled U.S. Pentagon military commissions unconstitutional. Didn’t mention that the only evidence points to Omar’s innocence. They didn’t mention that Canada failed to comply with obligations under the UN Convention Against Torture and despite their knowledge that Omar had been tortured, visiting government officials handed over their interrogation records to Omar’s U.S. captors. They didn’t mention the Supreme Court ruled that the conduct of Canadian interrogators violated Omar’s fundamental human rights, the Canadian Charter and principles of fundamental justice. 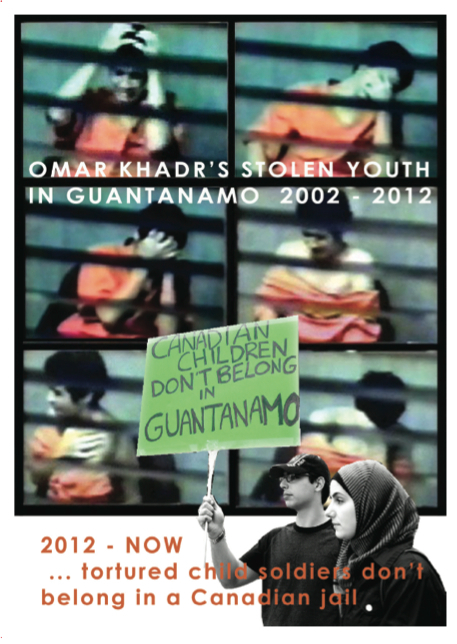 They didn’t mention that Omar, 15 at the time of his capture in 2002, should have been immediately released. They didn’t mention that the Covenant on International Juvenile Justice discourages detainment of juveniles and requires prompt determination of cases for those under 18. The U.S. military held Omar for two years without access to a lawyer and he waited anther three years before any so-called charges were laid. They didn’t mention that in the recent Hamden case, the U.S. Appeals Court recently threw out similar “charges” against Osama Bin Laden’s driver since they are not internationally recognized and cannot be applied retroactively. They didn’t mention that Arlette Zinck, Associate Professor at King’s University College Edmonton, had appeared on a local morning show to discuss her five years volunteering as Omar’s educator. Didn’t mention that along with Dennis Edney, there could not be a more credible advocate for Omar. Their care, dedication and positive influence have been the main component of Omar’s ability to survive these years of abandonment, injustice and suffering. Kathleen Copps, a retired B.C. teacher and member of the Vancouver Free Omar Khadr Now Committee, was one of the many supporters who attended Omar Khadr’s recent court hearing.